This blog post is well overdue and I apologize for that. I recently had the opportunity to dine with my former roommate, her sister, and her sister's friend, both of whom I had heard so much about and was very excited to meet. I was the first in our party to arrive and was immediately welcomed by the maitre'd who offered me a seat at the bar while I awaited my company. Before my former roomie Katie arrived I connected with Maggie and Adele; it was great to meet them after hearing so many great things about them from Katie. While we waited for Katie we took our seats and peered over the extensive gluten free menu. Once Katie arrived we dove in to ordering and were assured by our waiter that we were not going overboard in our ordering. We decided to start with the Arancini, a plate of fried risotto balls filled with spinach and mozzarella cheese and made it in a dedicated gluten free fryer. It's rare that I stumble across a gluten free fryer so I knew I had to order up something that was fried to take full advantage of the opportunity. For our entrées we ordered a smorgasbord of food. For pasta we ordered the Tonnarelli, prepared with fusilli pasta, porcini mushrooms, parmigiano cheese, parsley and rosemary. For our pizza selection we ordered a Bufala Cruda, made with buffalo mozzarella, cherry tomato sauce; a Fungata, prepared with porcini, portebello and shitake mushrooms, and assorted cheeses; and finally a Spinaci topped with spinach, ricotta, cherry tomato sauce, mozzarella, and garlic. Not too shabby of an order, eh? Needless to say, we did quite a number on the pizzas and pasta leaving barely any to take home. I think the best part of my meal was hearing each of the girls say that they couldn't differentiate the gluten free pizza from gluten-filled pizzas they had eaten in the past. The crust was delicious, flavorful, and unlike many of the overly crunchy and thin gluten free pizzas that I often encounter. Hearing the girls' positive reviews of the pizza at Pala was like listening to a symphony of Britney Spears songs: pure bliss. I loved everything about Pala, from the superb waitstaff, delicious food, and unique options available to gluten free eaters; perhaps best of all was the wonderful company. I can't wait to go back to Pala and explore the enormous gluten free menu... I already have my eye on a few options for my next visit! I always love exploring new areas and have been derelict in exploring the great neighborhoods and museums that New York has to offer. I finally corrected that in a marathon day on Saturday, beginning at the Museum of Modern Art and meeting Traivor there. After the museum we headed over to a great wine bar in Hell's Kitchen, just a bit west of MoMA, called Ardesia. It's on a very new block in the neighborhood and is surrounded by beautiful, newly-constructed buildings. The bar is a large space with a great vibe and a delicious selection of wines. By the time we had finished our glasses, we were both feeling peckish. I don't know the neighborhood very well, so I charged Traivor with finding us a good restaurant with gluten free options. 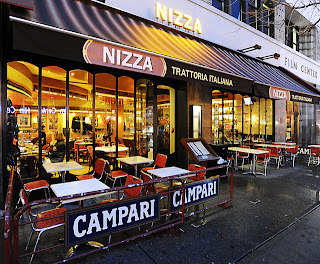 He suggested Nizza and mentioned that the restaurant has an extensive gluten free menu. When we arrived to Nizza I wasn't disappointed by the gluten free menu, as the restaurant serves up gluten free pasta and their own unique pizza-like dish, Socca. Soccas are chickpea pancakes that are served similarly to pizzas and are available with various toppings. They can also be ordered plain, but after asking the waitress' opinion I opted for the Vegetarian Bianca. We also ordered a bottle or red wine to complement our dishes, although I can't remember which bottle we selected. While we sipped our wine a busboy came over and dropped off two loaves of bread: one gluten free and one not gluten free. I was so excited and shocked to have my own bread at the restaurant. The bread which Nizza serves is crunchy with great seasoning that really embellish the flavor; even though Traivor isn't gluten free, he prefers the gluten free bread. It's always a testament to the quality of a gluten free product when a non-gluten free person enjoys it. Soon after I picked my jaw up off the floor after being given gluten free bread, the vegetarian socca and Traivor's dish were delivered to our table. The vegetarian socca came topped with spinach, mushrooms, artichokes, and roasted peppers and was absolutely delicious. Instead of being too crunchy with little flavor like many other gluten free pizza crusts, the socca was chewy with a sweetness to it. I would definitely go to back to Nizza and try another one of the restaurant's soccas; the waitstaff is friendly, the prices are decent, and the ambience is great. My friend Ariel recently told me that as she was walking around her neighborhood she saw G-Free NYC, an entirely gluten free store. While the Upper West Side is a bit of a trek from my apartment, I couldn't resist the opportunity to check out a potential gluten free mecca and so I made plans to meet a friend for a walk in Central Park and then visit G-Free NYC. When we arrived I was initially overwhelmed, as the store is small and packed with treats. I am also used to having to pick and choose through products to find gluten free ones instead of being able to eat everything, so to have so many choices after so many years of not having an available variety made for an exciting shopping experience. The store carries products including fresh-baked bread, cupcakes from Tu-Lu's, cake balls from The Little Cakes, pastas, chips, cookies, crackers, candy and even breath mints. Best of all, they had many products which I had never seen before and I always enjoy diversifying my eating. 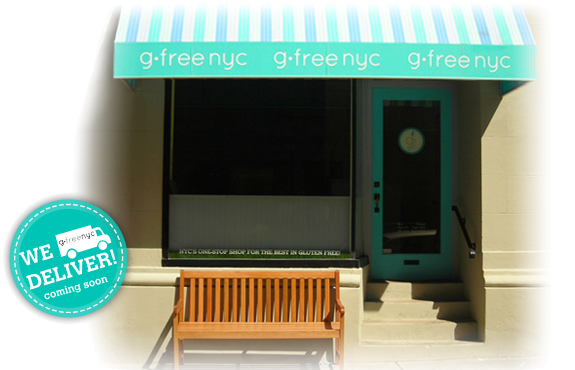 While G-Free NYC is not in the most convenient location for me, I will definitely be going back to support the business. I especially loved how many freshly baked goods the store sold and how unique some of the products sold are.